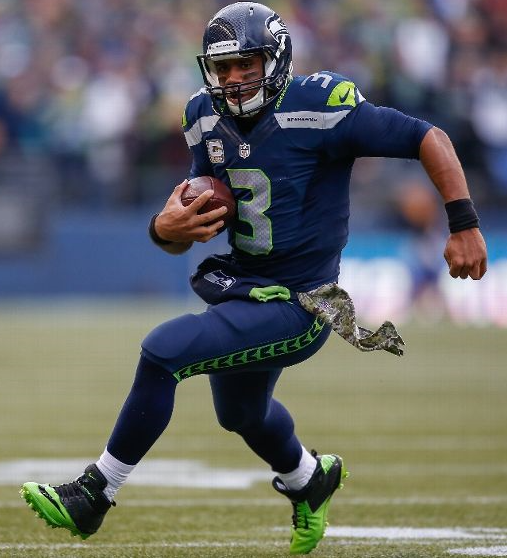 If the Seahawks beat the Packers on Sunday, as expected, it will be Russell Wilson’s third win vs. Aaron Rodgers. And then Wilson probably will beat Rodgers again within the next two or three months — in contract value. Rodgers, who is the favorite to be named league MVP, signed a $110 million deal in 2013 — and obviously has been worth it. But another Super Bowl win for Wilson probably would trump another MVP award for Rodgers (who also won in 2011) when it comes to the negotiating table. Rodgers’ deal guaranteed him $54 million and will pay out $62.5 million over the first three years. The Seahawks — always willing to pay their homegrown stars — are likely to give Wilson a deal that exceeds Rodgers’ contract, guaranteeing as much as $60 million. A double rainbow at Seahawks headquarters in Renton on Friday was quite apropos considering K.J. Wright and Cliff Avril got their pots of gold. 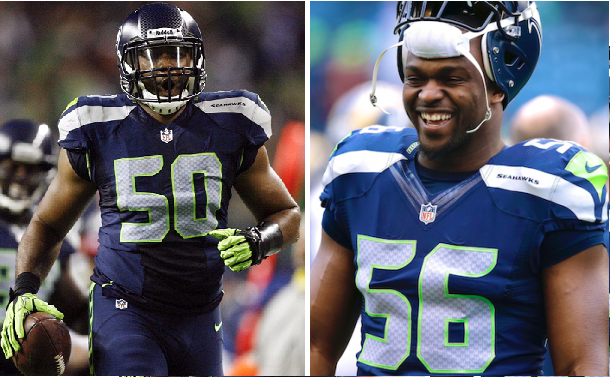 The Seahawks’ deals for Cliff Avril and K.J. Wright had been in the works pretty much all year, so it was no surprise they got them done before the end of the season. It takes away the top two players from Seattle’s sizable 2015 free-agent list and means Seattle now has all but one starter from the league’s No. 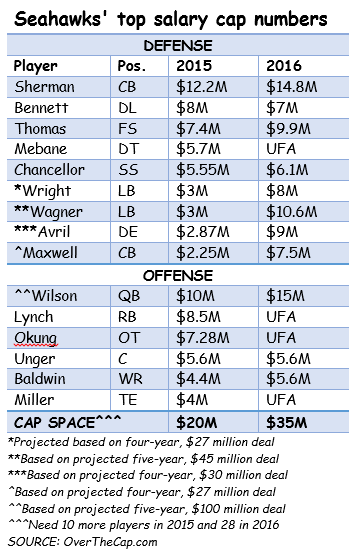 1 defense under contract next year (two if you add Kevin Williams to Byron Maxwell). 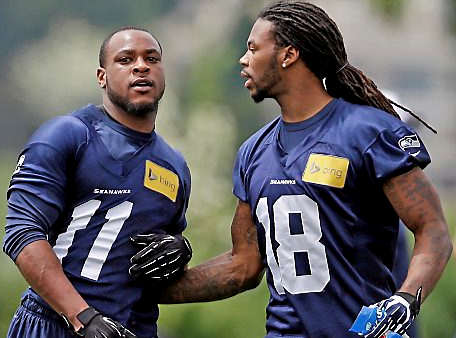 Wright and Avril join Legion of Boom stalwarts Kam Chancellor, Earl Thomas and Richard Sherman, plus defensive lineman Michael Bennett, as the keys to a defense that could reign over the NFL through 2017. K.J. Wright’s $27 million contract extension is the latest proof that John Schneider and the Seahawks are willing to pay a premium to keep their favorite players. 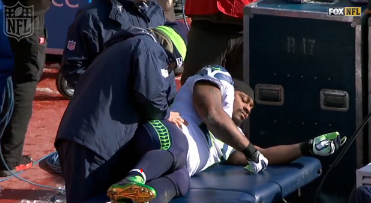 The Seahawks paid Wright more than they really needed to — he admitted he had a lower figure in mind. We recently projected they would offer him $4 million a year, which was their original goal, per ESPN’s John Clayton, who said Wright wanted $5.5 million. Instead, they made him the highest-paid 4-3 outside linebacker in the NFL, according to OverTheCap.com. The only outside linebackers with better deals are the guys who rush the passer. The Hawks obviously value Wright’s versatility — he can play inside or out. But they seemingly overpaid him, just as they did Red Bryant when they gave the run-stopping end $7 million a year. 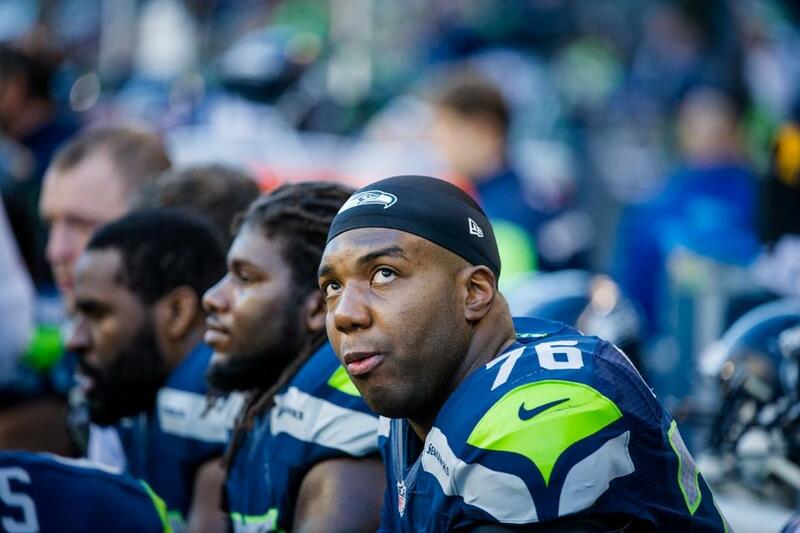 replacing him next year, but the bigger question is whether the Seahawks should replace the left side of their line — Russell Okung and James Carpenter — over the next two years. The Hawks are unlikely to give up on Britt so soon, but they definitely will have decisions to make along the line in the next couple of years, especially with three starters up for free agency — not that we can tell a starter from a backup anyway, considering injuries continually knock out Okung, Carpenter and center Max Unger. Offensive line has long been Seattle’s weakest link — and that predates John Schneider, Pete Carroll and Tom Cable. The last time the Hawks started the same five all season was 2007, and they have averaged seven combinations a year in five seasons under this regime. They really need to find some consistency so the offense can progress. 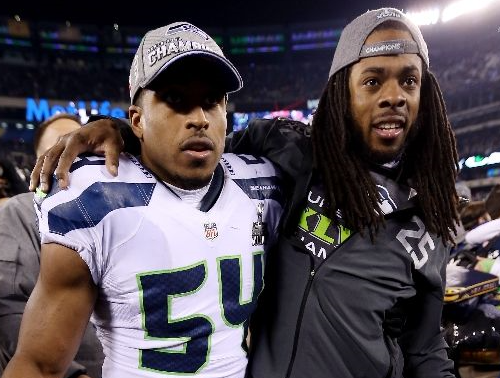 How much will Bobby Wagner cost? Bobby Wagner has been a major reason the Seattle defense has put the clamps on Arizona, San Francisco and — most impressively — Philadelphia over the last three weeks — and teammates are singing his praises. Wagner’s agent obviously hopes general manager John Schneider recognizes it and will be ready to pay Wagner in the next two years. re-established themselves as the Super Bowl repeat threat we all expected them to be. Assuming the rejuvenated Seahawks maintain their dominant play and take it to the same conclusion as last year, the big question will become: How do they keep this going to create that dynasty we all projected? office and that it stems from the running back’s offseason contract dispute. NFL.com continues to reiterate that the team will part ways with Lynch after this season, and Carroll did little to dispel that notion Monday on 710 ESPN. 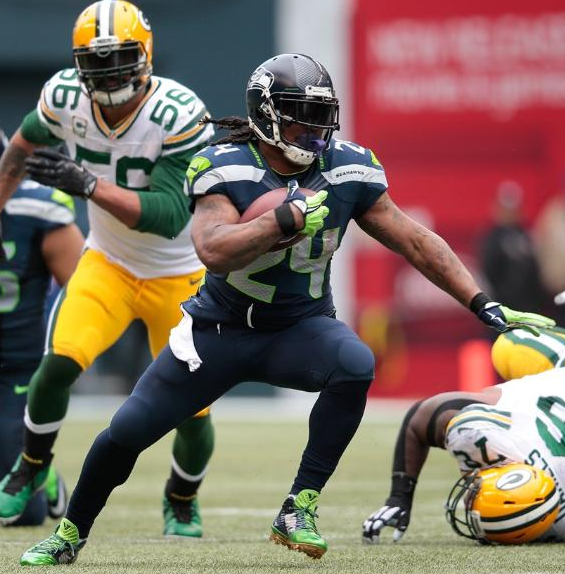 While it certainly is possible that Lynch returns in 2015, all signs seem to point the other direction. Percy Harvin’s contract was an albatross from the ill-advised moment the Seahawks decided to guarantee him $25.5 million in a deal that included salary cap hits north of $12 million from 2014 through 2017. It seemed farfetched that he would last that long at those numbers; thanks to his alleged anti-team antics, the Hawks just ended up cutting ties much earlier than anyone thought they would. Even though he will still count $7.2 million in proration in 2015, the Seahawks divested themselves of the remainder of his $11 million salary this season and his $10.5 million salary in 2015. With the trade official, the Hawks are not paying his $647,000 salary this week, so they will recoup $7.1 million this season. Add that to their net savings of $5.7 million in 2015, and the Hawks pulled an extra $12.8 million in cap space for next offseason. That gives the Hawks a lot of wiggle room to re-sign some of their key free agents, if they choose. Have Hawks finally learned lesson about overpaying receivers? Hopefully the Seahawks learned their lesson once and for all about overpaying for wide receivers. Percy Harvin is the team’s fourth big-money bust at the position in the past decade, joining underperformers Deion Branch, T.J. Houshmandzadeh and Sidney Rice. It was easy to see coming. The Hawks paid $84 million to those four players — receiving just 116 games and 31 touchdowns in return. Talk about dropping the ball.